Hi Penpal! I'm sorry I don't know your name yet... I'm sure it must seem a little odd to you that I keep sending you so much information about myself when I don't know anything about you yet! Anyways, I still look forward to hearing from you so that I can get to know you better. In the mean time, I would like to share my latest postcard with you. I wrote this postcard about who I consider a hero in my life - which is my mother and on a more general level, all teachers. My mother (shown in the upper left corner) has been a secondary school teacher for over 20 years. She is one of the best people I know and she inspires her students to always try harder in order to realize their own intelligence and unique skills. 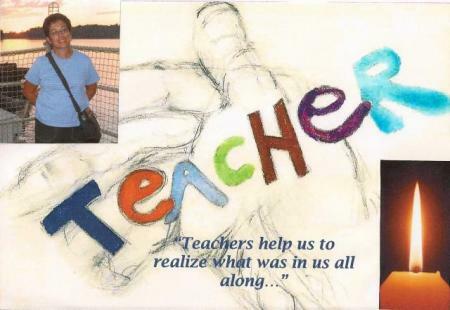 This is why I included one of my favorite quotes about teachers - "Teachers help us to realize what was in us all along." I strongly believe that teachers do not make us smart; rather they help their students to develop their own gifts and talents. I admire my mother and all other teachers because I think it takes a special person to take a student by the hand and open up a whole new world for them. This is why I would like to become a teacher. How about you? What is your teacher like? Do you have a hero in your own life or just someone you admire, but not necessarily know? I'm looking forward to hearing from you!